MUZAFFARABAD, Jammu and Kashmir, October 13, 2011 (ENS)  Survivors of the 2005 South Asian earthquake are still waiting for permanent resettlement and reconstruction of damaged infrastructure in Pakistan-controlled Kashmir and the northern Pakistani region, six years after the disaster. People blame poor performance of government departments and alleged mishandling of international aid for the delayed completion of reconstruction work. But the government says that frequent disasters and floods since 2005 have diverted its attention and resources from the quake-hit region to other areas of the country. On the morning of October 8, 2005, a 7.6 magnitude earthquake struck South Asia, felt across Pakistan, India and Afghanistan. Its epicenter was in Pakistan-administered Kashmir, near the capital Muzaffarabad. In Pakistan and the Kashmir region it administers, over 73,000 people were killed and 100,000 were injured by the quake. An estimated 2.5 million people were left homeless just weeks before the beginning of the Himalayan winter. The tremor caused total damages and losses of $6.2 billion. In Indian-administered Kashmir 1,360 people were killed and 6,266 were injured. 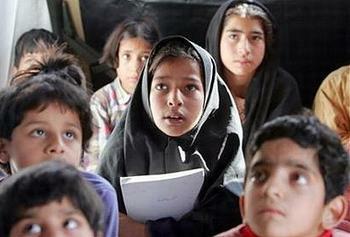 Four causalities also were reported in Afghanistan. The earthquake damaged almost all the infrastructure of three major cities of Pakistani Kashmir, including Muzaffarabad. Balakot City in Pakistan’s northern Khyber Pakthoon Khawa province was completely wiped out. In total, the quake destroyed 58,808 schools and colleges as well as 307 hospitals and medical units, 2,393 kilometers of roads and 92 bridges, which made the relief and rescue operation difficult. This year, Pakistan observed the anniversary of the tragic quake as National Disaster Awareness Day, pledging to make cities more resilient to disasters and educate the people about disaster risk reduction. On October 8, Pakistani Prime Minister Yousaf Raza Gillani visited Muzaffarabad to pay homage to the families of victims and to inaugurate a newly-built school. Remembering their dead relatives and friends, people mourned for victims and protested the incomplete reconstruction. Protestors say that to date nongovernmental organizations and other foreign donors have built the only completed projects, while the Pakistani government has failed to rebuild schools, hospitals, roads and other basic facilities. The government has able to build only 33 percent of the schools and colleges in Pakistani Kashmir, where over 200,000 school children are forced to study in tents and tattered shelters. In Khyber Pakhtoon Khawa province, the government has rebuilt almost half the damaged hospitals, schools, roads and bridges, but 20,000 students still must study under the sky in the cities of Abbottabad, Mansehra, Battagram, Kohistan and Shangla because educational facilities are not restored. People are accusing the Pakistani government of abusing reconstruction aid. “The Government of Pakistan has diverted US$450 million in aid to some other projects, which is hampering the pace of reconstruction,” says Farooq Haider, former Prime Minister of Pakistan-administrated Kashmir. Government agencies as well as NGOs have reported incidents of widespread corruption and lack of transparency in the use of international aid. The Auditor General of Pakistan, the highest financial regulator of the country, has traced serious irregularities in the Earthquake Rehabilitation Authority, the organization established after the earthquake to undertake rebuilding of the affected region and resettlement of its people. The government has introduced earthquake-resistant building regulations and only those who comply with them are supposed to be given assistance. But the Auditor General’s report reveals that thousands of people were illegally paid, although their houses were not damaged in the quake or they did not follow the new building codes. 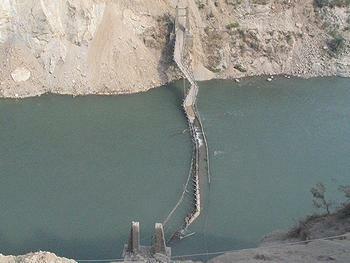 Government officials say that the 2010 and 2011 floods forced the government to redirect the money meant for earthquake victims to survivors of floods and other disasters. “The government has released far less funds last year than were needed to achieve the rebuilding of the earthquake-hit region,” confesses a senior government official. In 2005, the World Bank and the Asian Development Bank estimated US$3.5 billion would be required for rebuilding, yet Pakistan received only $576 million in aid for rehabilitation of quake victims, says Global Humanitarian Assistance Organization in its GHA Report 2011. 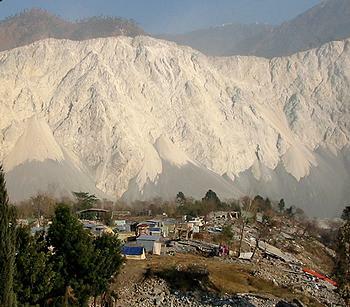 Shafique Qureshi, a geologist associated with the Asian Development Bank admits that less than half the affected population has been relocated to safer places from the red zones declared to be dangerous. Located on sloping hills and active fault lines, the city of Muzaffarabad is overpopulated and lacks the capacity to accommodate more people at decent living standards. A large part of the population still lives at faulty locations, where the chance of loss in future disasters is high. “One key thing that we learned from all recent major destructive earthquakes is that the structures kill people not the earthquakes,” said Dr. Afroz Ahmad Shah, an earthquake expert at the Earth Observatory of Singapore, a research institute of Nanyang Technological University. Shah believes earthquake resistant structures are required to minimize the effects of such catastrophes.